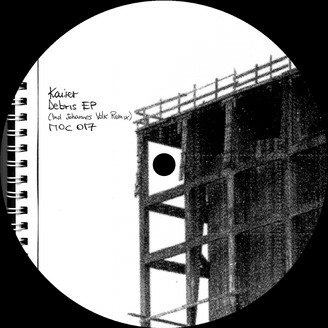 Italian club staple and producer Kaiser turns to MOC for his Debris EP, showcasing three agile Techno slices and a remix from Exploration Records chief Johannes Volk. “Parachute” opens up the release in a spellbinding, energy-heavy manner, with its whirlwind groove and lead taking no prisoners. Next up is “Debris”, showing off an equally energetic prowess channeling zig zagging synths and a more melodic, yet still heavy strung bassline. “Esplosione Di Colori”, translated as ‘color explosion’ aptly translates into sound what is usually only possible for a paint canvas. A lighthearted, arpegio-ridden track in original, Johannes Volk works his magic, turning it into a versatile piece of raw, dubby Techno.